If you are an SEO guy or a webmaster or blogger, you must be knowing much about SEO. I am not going into the basics of SEO as you must be having a sound knowledge of that. The off page SEO nowadays matters a lot and backlinks are one of the main constituents in off page SEO. It is the “rel” in hyperlink tag that decides whether the link will be of nofollow or dofollow. For example, the first link below is nofollow while the second is dofollow. No doubt, to keep yourself away from spams and Google Penalty, you must create a proper ratio of nofollow and dofollow backlinks. We all know the benefits of dofollow backlinks as it helps much in the off page SEO but what about nofollow? Well, nofollow also helps a lot in SEO. Here in this post, I will talk about benefits of nofollow backlinks. But before talking about benefits of nofollow backlinks, let’s see what nofollow backlinks are? In very simple words, nofollow backlinks are those backlinks which don't pass any link juice. This type of links says the search engine that doesn't follow/count this link. These kinds of links are just for reference purpose but still value a lot. Though nofollow links don't provide any link juice but still much valuable for the SEO and several other benefits which I am going to talk away right now. So here are the advantages of nofollow backlinks. This is one of the main benefits of nofollow backlinks. Though Dofollow links provide link juice if you will make an excess of dofollow links, Google will treat that as a spam and maybe your site can get outranked. So it is necessary to keep a good ratio of nofollow and dofollow backlinks. Usually, a 50/50 ratio of nofollow and dofollow is considered impressive. More than 10% can be managed, but more than that of dofollow links may cause penalty for your site. 2. Traffic...what else you want? Traffic is the most important thing for any website. We have talked a lot about TRAFFIC in past as how it help in blogging or any online venture. Nofollow links help you to get good and quality traffic. Suppose you have commented on some blog, and you are getting traffic from it. So this traffic will be your targeted traffic as you have commented on the blog which is in your niche and their traffic can be beneficial for you as well. I remember once I commented on a blog (which had good social signal) and almost every month it was giving me around 500-600 traffic. This was not much but was quite good as I had to do nothing and was targeted. I received it for around 3-4 months. So this is the power of nofollow links. I am not saying that dofollow can’t bring traffic, but most of the site from the similar niche provides nofollow links, and we should not ignore that. If you are writing a quality post. Here quality post means the post which has been written for the users, not for the search engines. For example, you have written a high-quality post, and it has been linked my few sites so just think about how much referral traffic you will get. Also, as some good site will link you so, it will also help you to increase your authority which is very much necessary to be in the game. These are very powerful tips to increase links and hence authority. Now advertisers check the quality of site through Alexa rank and DA. Lower the Alexa and higher the DA, the high is the quality of your site and the more amount you will get on advertising something. If you will see how to increase domain authority, getting quality backlinks are among the top techniques to increase domain authority. So by getting recommended by some of the authority blogs through a link, you can increase the domain authority of your website easily. Also, through blogger outreach campaign you can increase nofollow links and referral traffic. This is another beauty and benefits of nofollow backlinks. If your domain has 100% nofollow backlinks also, you will never get penalized. This is due to the reason that search engine considers nofollow links as just a reference and doesn’t pass any link juice and so no harm to your website. However, if you have 100% dofollow backlink, you will undoubtedly get hurt from search engines. So, it’s safe to have nofollow backlinks. 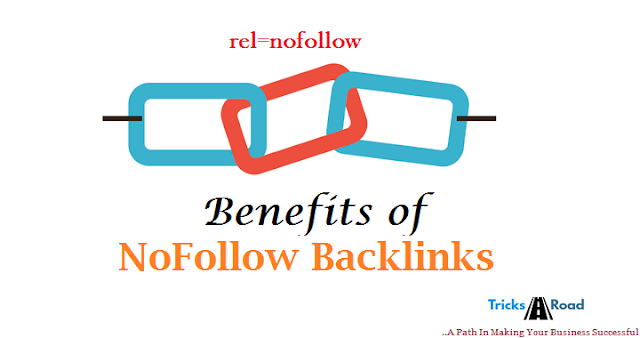 No doubt both dofollow and nofollow backlinks have their importance and benefits. Dofollow helps you to rank well in search engines where as nofollow gives you several other benefits as explained just above. So you should make a good ratio of dofollow and nofollow backlinks. I hope I was clear enough to explain the benefits of nofollow backlinks. If you have any other benefits of nofollow backlinks, please share with us.